Wednesday’s release of durable goods orders showed a rather large downward revision to July’s data and an increase in August’s orders. The transportation component makes the overall reading of this report quite volatile. A more consistent read is gained by excluding transportation and defense goods, which showed a less dramatic 3.3% decline in July, followed by a slight increase of 1.5% in August. The year on year increase is 7.6%. 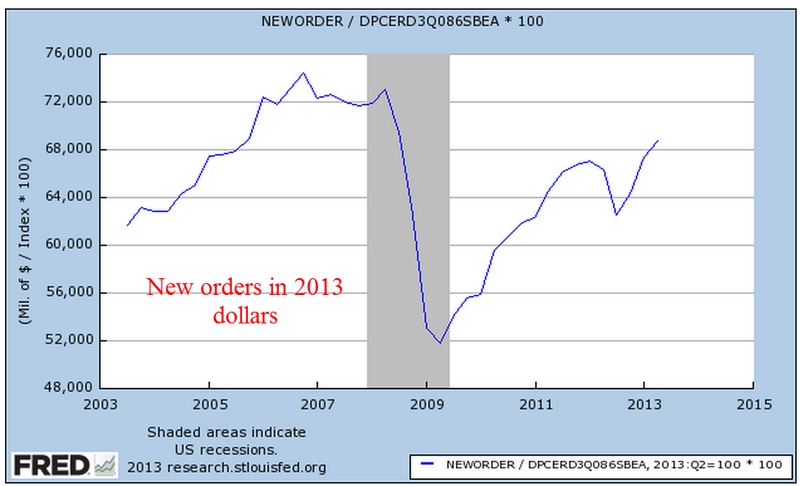 In nominal dollars, not adjusted for inflation, we have reached the level of new orders before the recession began in late 2007 – early 2008. 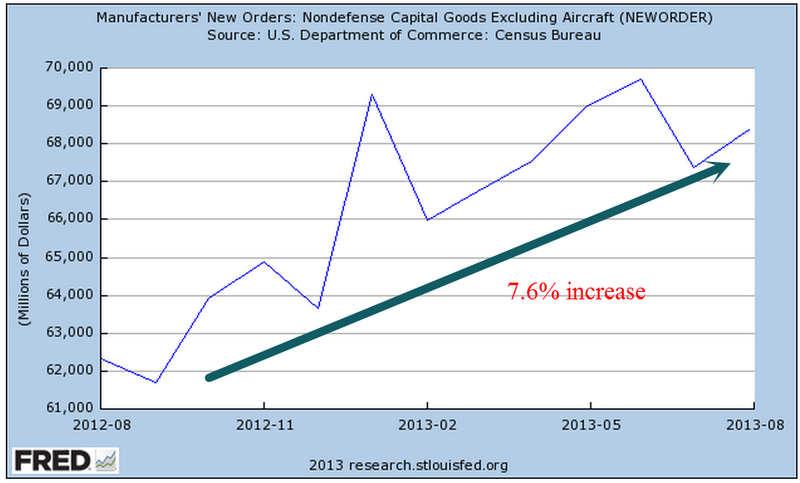 Had the economy stayed “on trend” new orders would be over $84 billion this year. When adjusted for inflation, we are at about 2006 levels – seven years of no net growth. 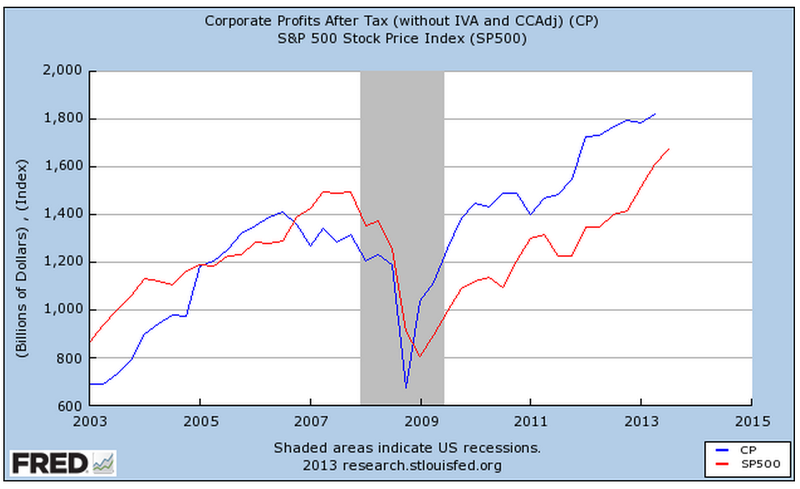 Second quarter corporate profits are up almost 6% and have tripled in the past ten years. Despite all the daily and weekly responses to political as well as economic news, the SP500 stock market index essentially rides the horse of of corporate profits. The market’s fluctuations reflect changing current expectations of future profits. 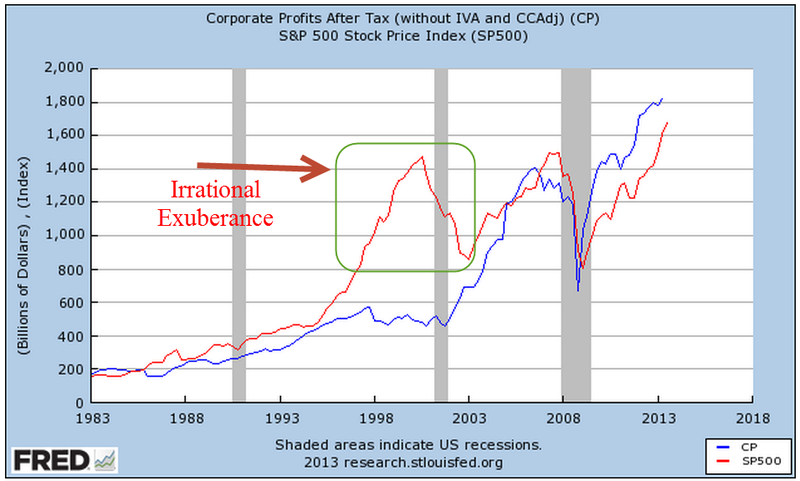 Except for the “irrational exuberance” of the late 90s, there is a remarkable correlation between the SP500 and corporate profits. Focusing on the past ten years, we can see these two forces as they dance around each other. As sales and profit emerge over each quarter, companies guide analysts estimates of profits up and down. The market renegotiates its value based on these revisions of emerging profit estimates. As a rule of thumb, an investor with a mid term horizon of 1 – 3 years might grow wary when these trends diverge as they did in the late 90s and 2006 – 7. 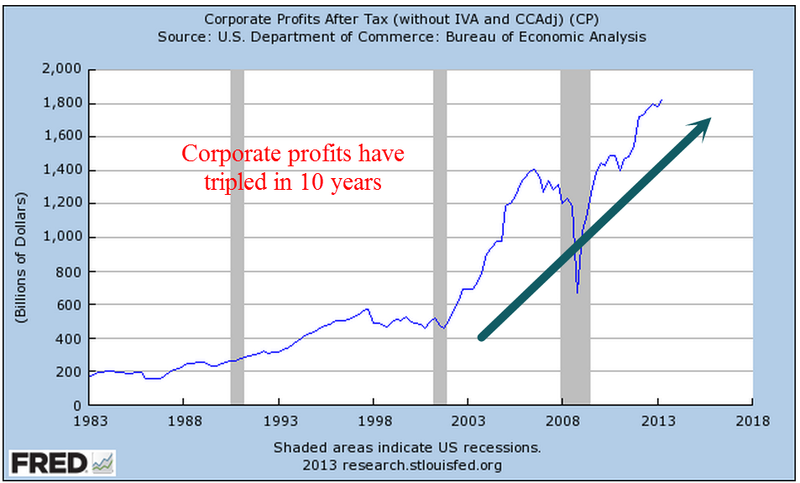 As a percent of the total economy, profits have doubled over the past ten years. 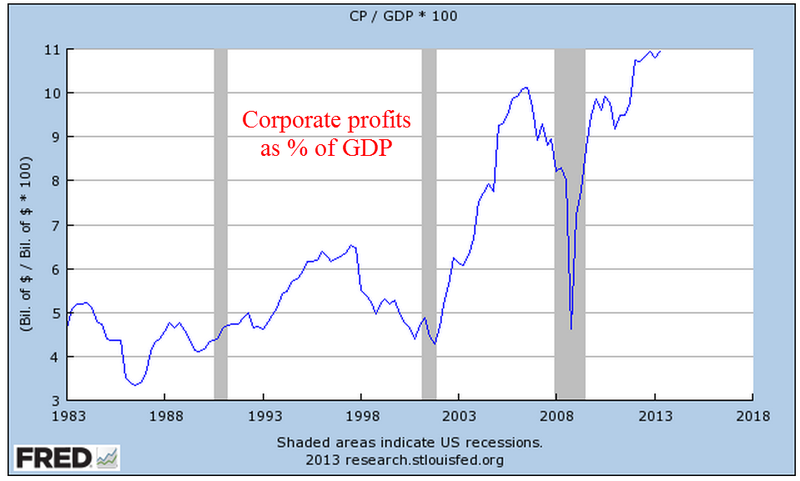 At the trough in 2008, when some financial pundits were forecasting the end of capitalism, profits as a percent of GDP were at the 25 year average. Investors had become used to this lop-sided economy where corporations grab more of the economic pie. A growing share of profits is earned overseas; that growing globalization and two decades of effective lobbying have enabled corporations to lower the tax bite on those profits. The taxation of corporations is a two-edged sword. 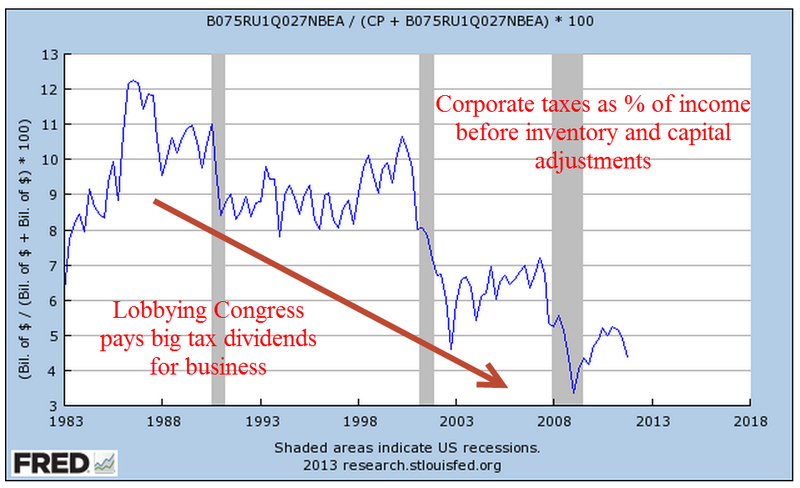 One effect of more taxes for corporations means less dividends to investors, who probably pay taxes at a higher rate than the effective rate of corporations. During the 1980s and 90s, dividends averaged around 40 – 50% of earnings after taxes. In the past decade and especially after the cash crunch of 2008, corporations have retained more of their earnings as an emergency cash cushion, paying investors about 30 cents on each dollar of earnings. That rush to safety will probably reverse itself in the coming years, prompting corporations to pay out more in dividends as a percent of profits. There may be volatility in the market in the coming days and weeks as Congress wrestles over the funding and implementation of the health care act, threatening to shut down most non-essential functions of the entire government. 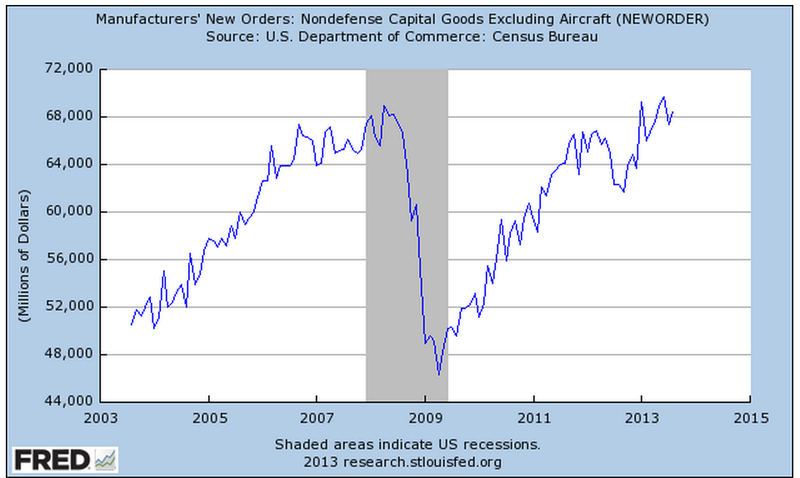 A similar budget battle in late July and August of 2011 was accompanied by an almost 20% drop in the market. The longer term trend is told by the rise in corporate profits, by the rise in industrial production and by the rise in new orders. A move downward in the market may be a good time to put some cash to work, or to make that IRA contribution for 2013.